He kisses and caresses her, tells her she’s so sweet. That he has eyes for no others and she was who he was waiting to meet. Their interests and their taste just seem to align and everything seems perfect, everything seems fine. Innocent laughs and gentle brushes turn into misguided hands and sexual touches. Her mind tells her, just tells her to wait, it’s too much too soon it’s all so insane. But she likes the feel, the feel of being touched, even more, she likes the idea of being loved. All the while her body betrays her and gives signs she doesn’t want to send. She feels weak and powerless she wants to give in, but this boy she just met, he isn’t even a friend. Yet somehow some way she makes things come to an end. Thanking God she was still strong enough to pretend. But time goes by and they meet again and it seems this time she just won’t withstand. There’s something about him she just can resist and everything seems so happy maybe this is finally her good twist. Maybe this is the happy ever after she’s been so longing for, maybe this time she won’t end up crying on the floor. So she gives it all, with all her might, she decides to give her heart and begin to fight. She fights for something that seems true and it almost seems like he’s fighting too. He wants the future and the happy ever after maybe this time it won’t be a disaster. She slowly learns to love her self again, just like she did before she met them. But time passes and things quickly turn bad, and the soft and gentle kisses surely come to pass. The intense nights filled with passion soon turn to screams and dark actions and she cradles a body that’s no longer there, that feels nothing for no one except for himself. But she holds on to an idea that doesn’t seem to pass, holding on to a misconception of something that won’t last. She lets herself get quieter every time and the demons in her mind start appearing outside of nighttime. She wants to escape but doesn’t know how she got stuck in a brutal love game and doesn’t know what to do now. So she closes her eyes and wishes for the best, maybe this was all some sort of test. A test she’ll never know if she passed or she failed, only that it took her, really nowhere. And she compares this with what she’s lived before and she finds herself, yes, that’s right, crying on the floor. That place to which she vowed she’d never return, thinking next time it would be their turn. So she crumbles away within her heart, knowing again it’s time for a restart. Sad and often too true in relationships. The picture reminds me of the beginning of James Bond movie so when I read your piece it made me think this wasn’t going to work out. 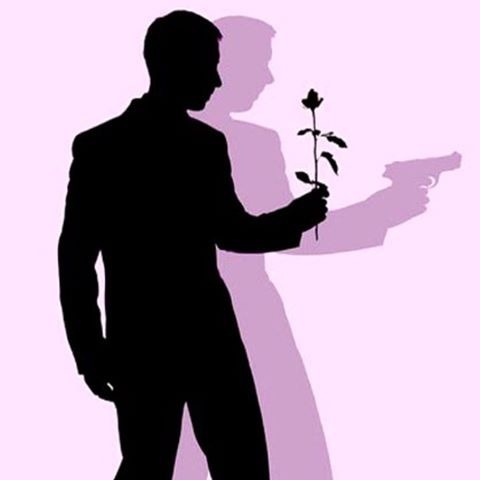 She loves him, but he’s James Bond and will move on to the next woman, never letting his heart become involved because of his first love. Great write and I love the appearance of your blog! A mixture of emotions beautifully expressed.